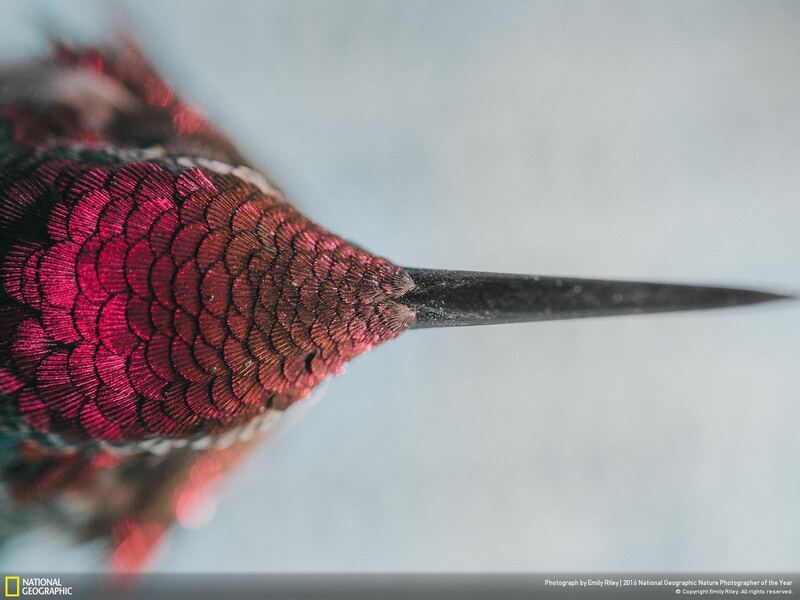 Now that the entry period for the 2016 National Geographic Nature Photographer of the Year has ended we have the editors top picks and photo galleries of the top entries. Here are my 20 favourite photographs from the final selection of entries from the National Geographic Nature Photographer of the Year 2016 contest. 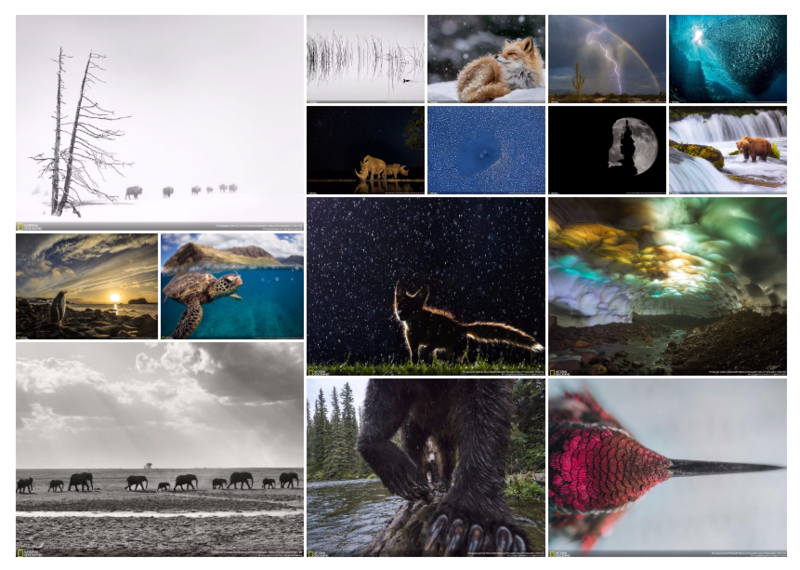 My favourite 20 images showcase the awe-inspiring and diverse natural world around us and are all available to download for your wallpaper! It is worth looking through all of the spectacular entries. Winners will be announced in early December. Who do you think will win? Which photograph is your favourite? Photo and caption by vincent h. This photo was taken in Hawaii on the island of Maui. In the Haleakalā National Park can be find one of the few silversword plant in the world, growing on the volcanos above 2,100 metres. I spotted this ladybird on it when I was looking at the flower during a hiking day. I liked the lights, the colors and the calm of the scene. Photo and caption by Brett Monroe Garner. 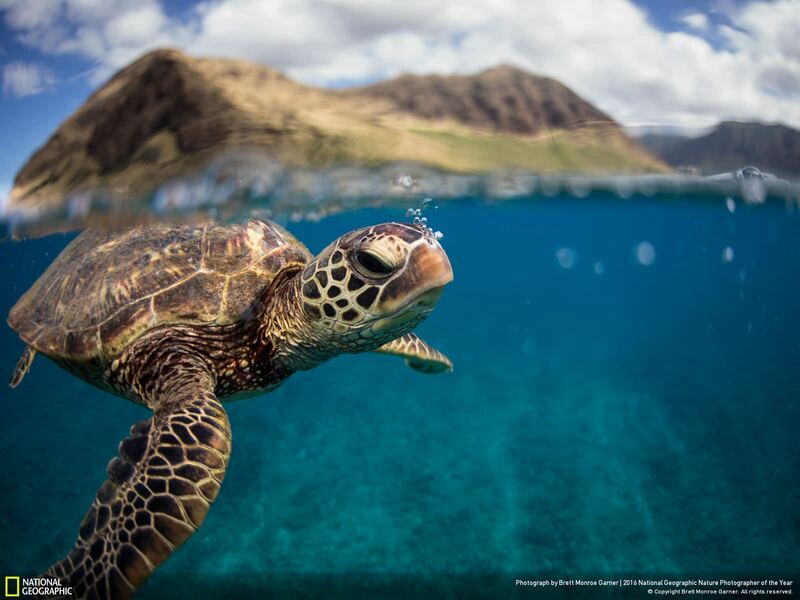 A green sea turtle at the surface off the coast of Oahu. I was able to spend the better part of an hour freediving alongside this turtle as it casually grazed on the sea floor below between gulps of air at the surface. Photo and caption by Peter Mather. 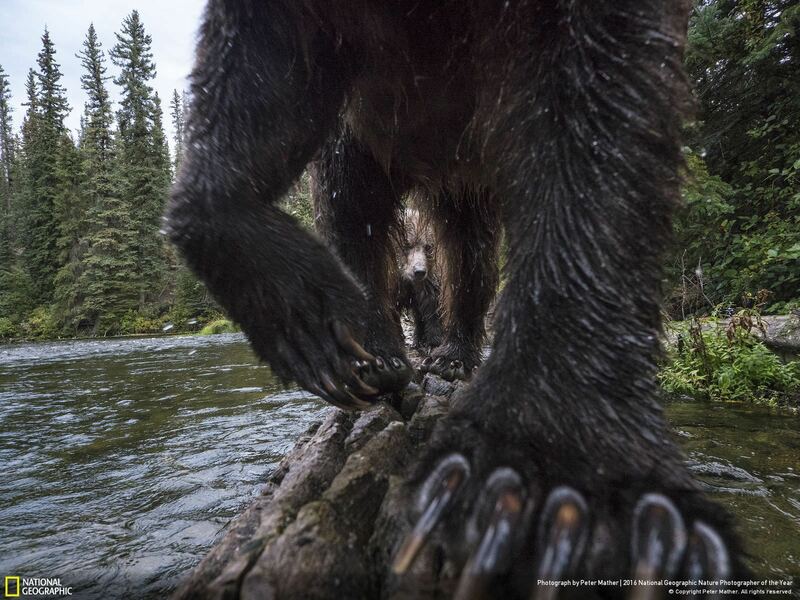 A grizzly bear sow and cub use a fallen log to fish for chinook salmon on a small creek in Yukon Canada. The long, sharp claws of grizzly bears are perfect for filleting salmon. 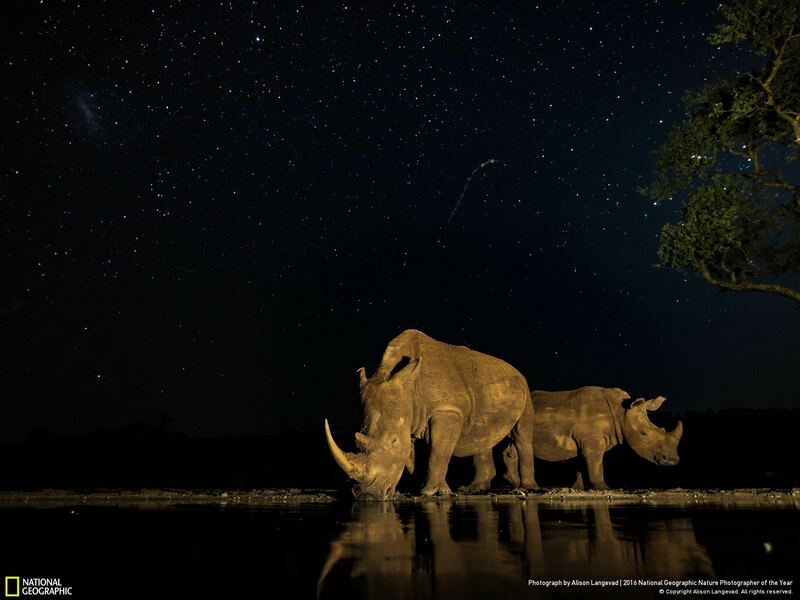 Image taken by a remote camera trap. Photo and caption by Andy Lerner. 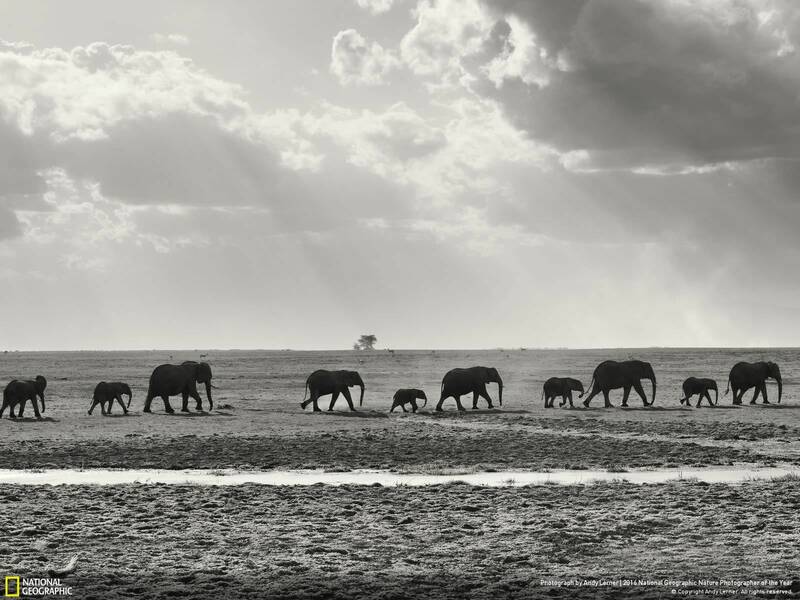 A group of elephants makes it’s way back to the forest after a day of grazing in the swamps. Photo and caption by Yu huiping. 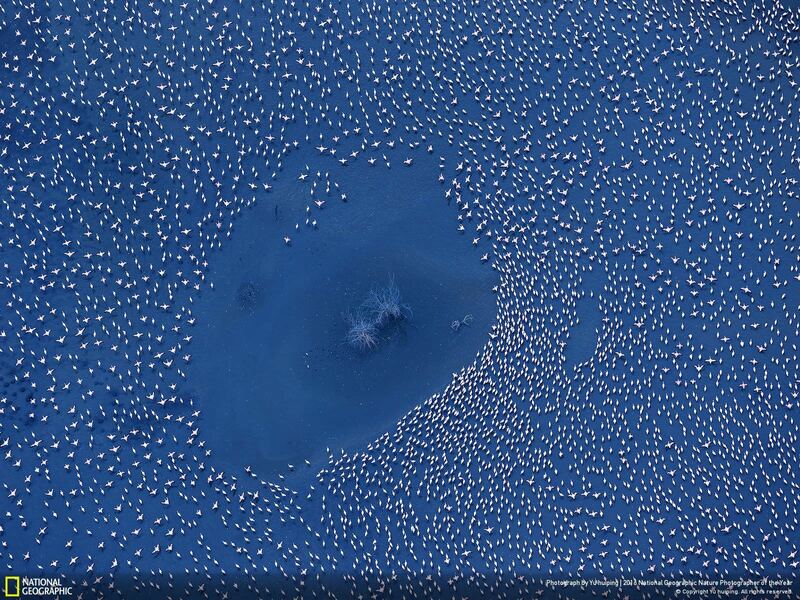 Thousands of flamingoes live in Bogoria lake where likes paradise for them. Photo and caption by Anna Onishi. “Hanami” is a Japanese tradition of enjoying and appreciating the blooming of the “sakura” (cherry blossoms) . The Japanese celebrate this event by throwing picnic parties under these beautiful soft-pink cherry blossoms trees. 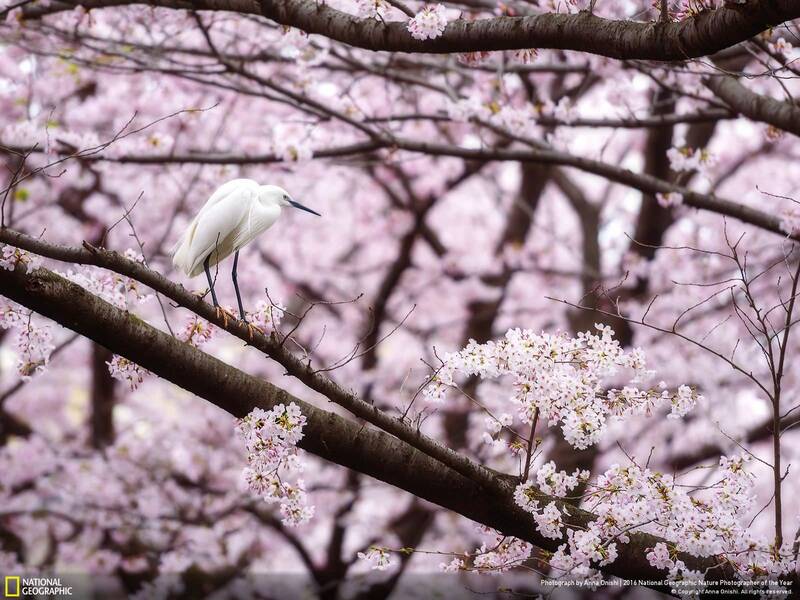 And a Egret also enjoyed Hanami. Photo and caption by Chris Schuhmann. 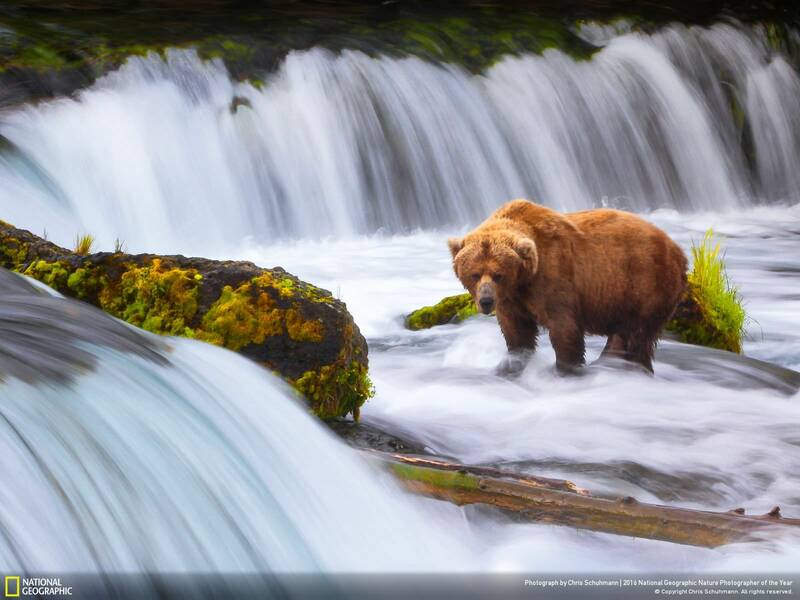 At Brooks Falls, this very patient brown bear was waiting for the salmon to show up, which they eventually would. She was so still, I was able to slow my shutter speed to capture this ethereal moment. Photo and caption by Greg McCown. 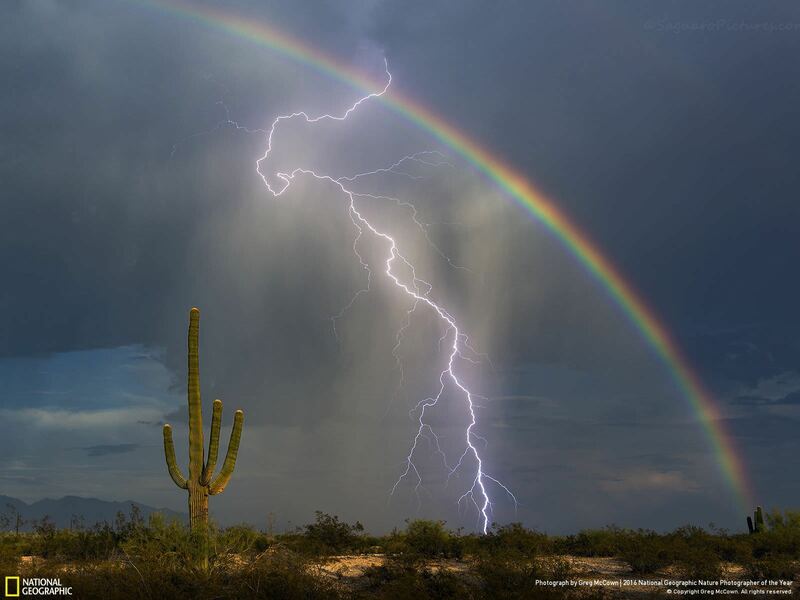 After 7 years of trying I finally got my lightning and rainbow picture. I spent the afternoon chasing storms with a pair of friends from Phoenix. After driving through a microburst on I-10, they decided to head back home. I decided to head back towards Tucson. I stopped in Marana to photograph this beautiful rainbow. It was difficult to find a spot without houses or telephone poles, but I did just in time. This lightning bolt came crashing down within minutes of setting up. Photo and caption by Edson Vandeira Costa. 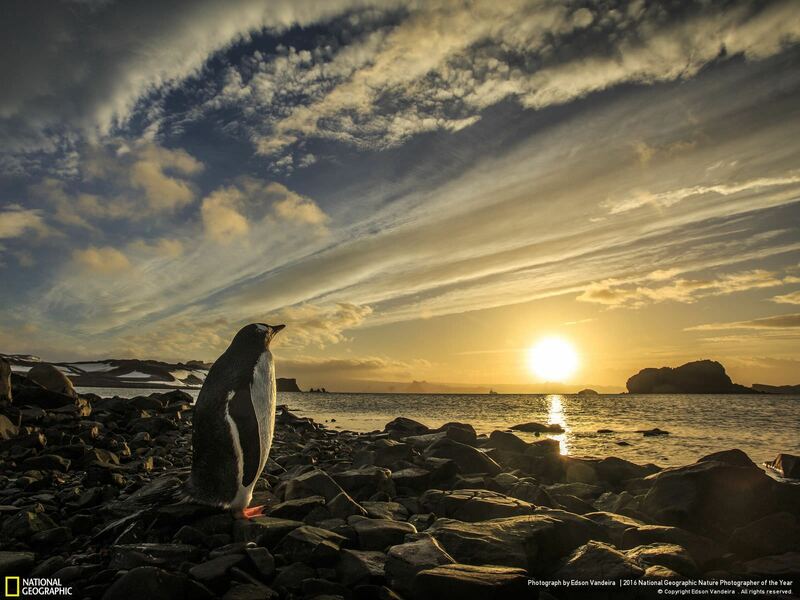 It was very early in the Antarctic morning and I was walking along the beach admiring the sunrise, then suddenly I had a wonderful surprise: meet this Gentoo penguin (Pygoscelis papua) already looking at the sun that was just on the horizon. At that moment I had the sensation that, like me, he had woken up very early to contemplate such a beautiful dawn. King George Island, Antarctica. 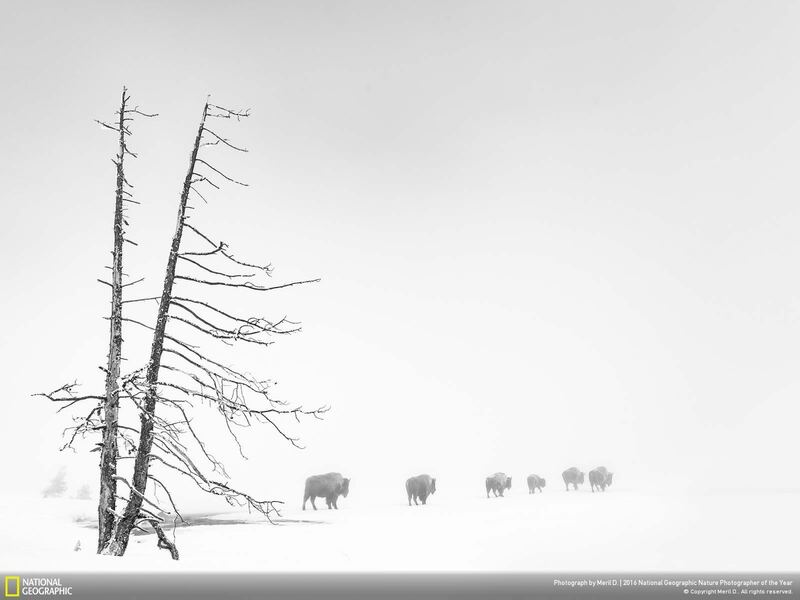 Photo and caption by Meril D. A herd of frosty buffalos walking in the snow towards thick fog produced by the Yellowstone geothermal activity. Photo and caption by Eileen Johnson. 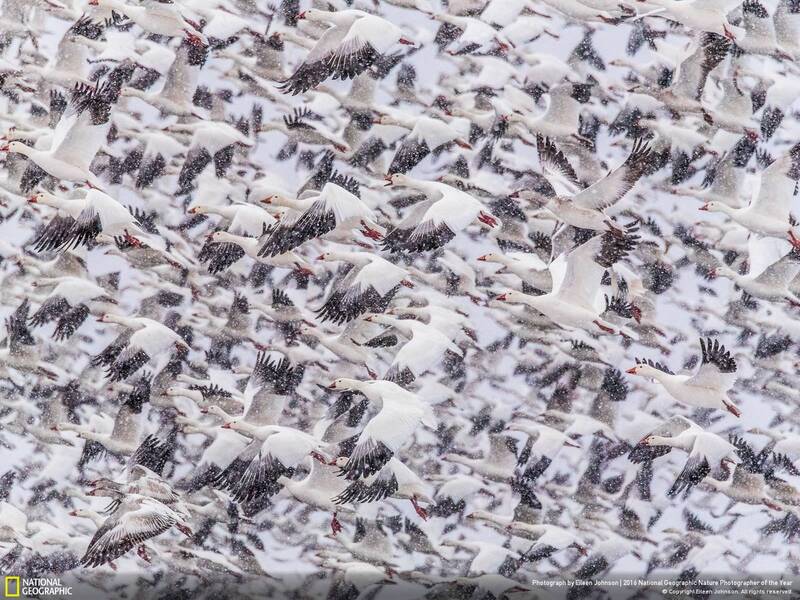 Thousands of snow geese take flight during a snowy morning fly out at Bosque del Apache, New Mexico It is loud and sounds like a passing train! Photo and caption by Hiroki Inoue. 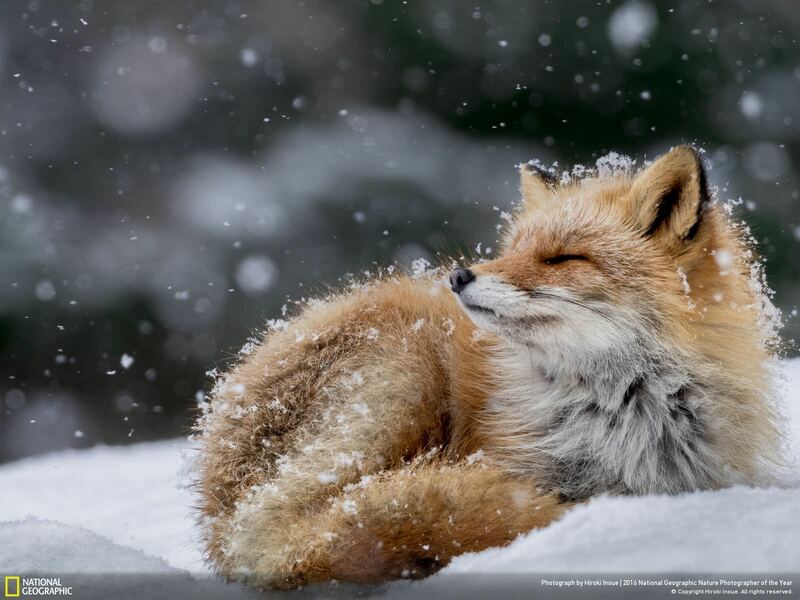 The fox was bathing in the snow flake. Photo and caption by Shane Kalyn. 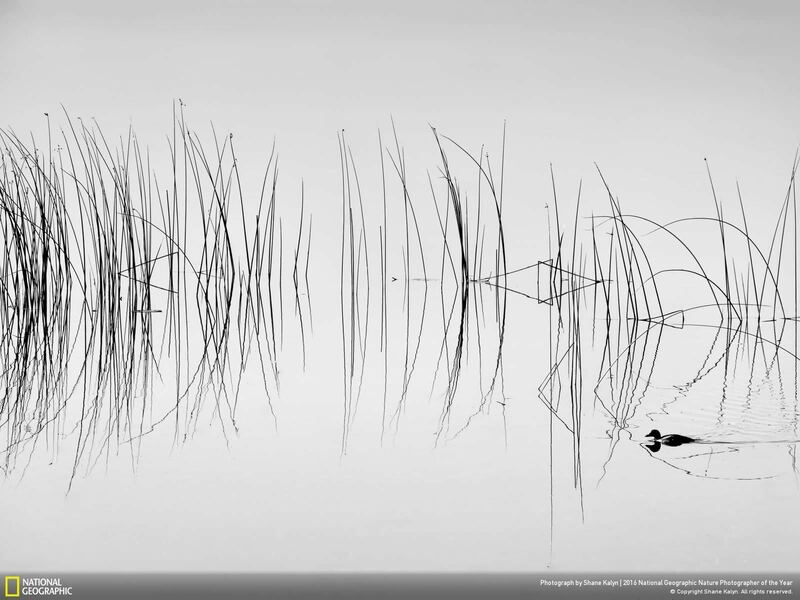 I was out taking photos of the early morning fog at Dragon Lake when the symmetrical reflections of these reeds really caught my eye…then, this duck swam through and totally made the shot! Photo and caption by Roger Bailey. 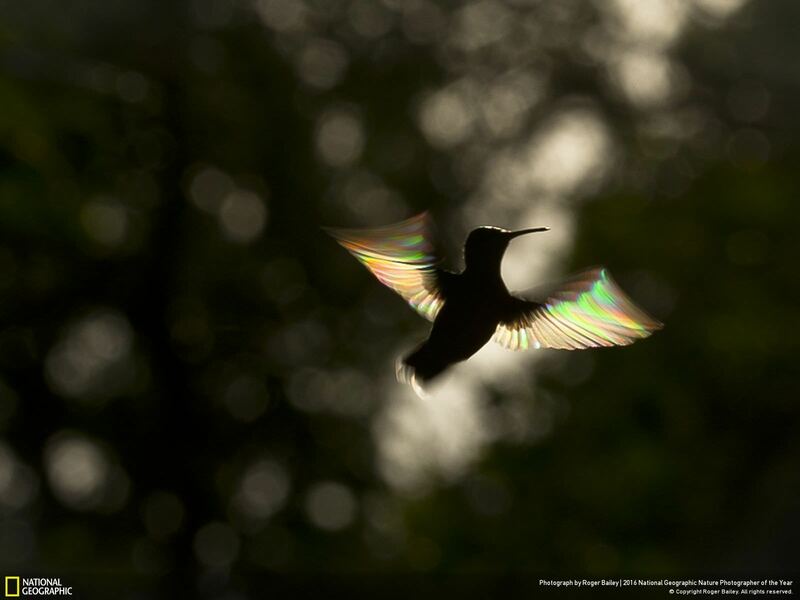 Evening light filters through a distant forest backlighting the translucent wings of a hovering Ruby Throated Hummingbird. Photo and caption by Michael McMahon. 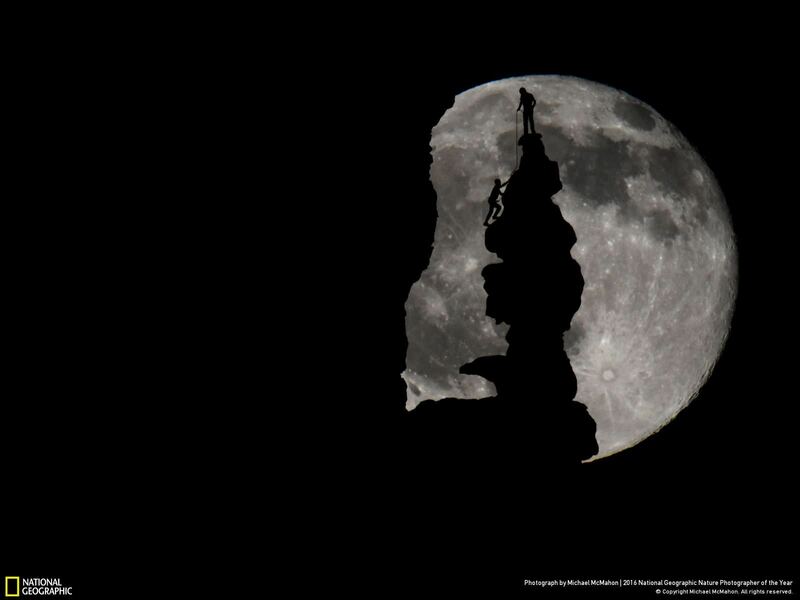 The photo captures two rock climbers reaching the summit of a 350 ft. tall sandstone spire in the Fisher Towers of eastern Utah. By my calculations, the formation is silhouetted by the moon only two or three nights per year. As the photo was taken from over a mile away, the angle between the camera and climbers had to align perfectly. I prepared for the shot for months, climbed the tower numerous times, and even fully surveyed the summit to guarantee the angles were correct. They were! Photo and caption by Vladislav Kamenski. 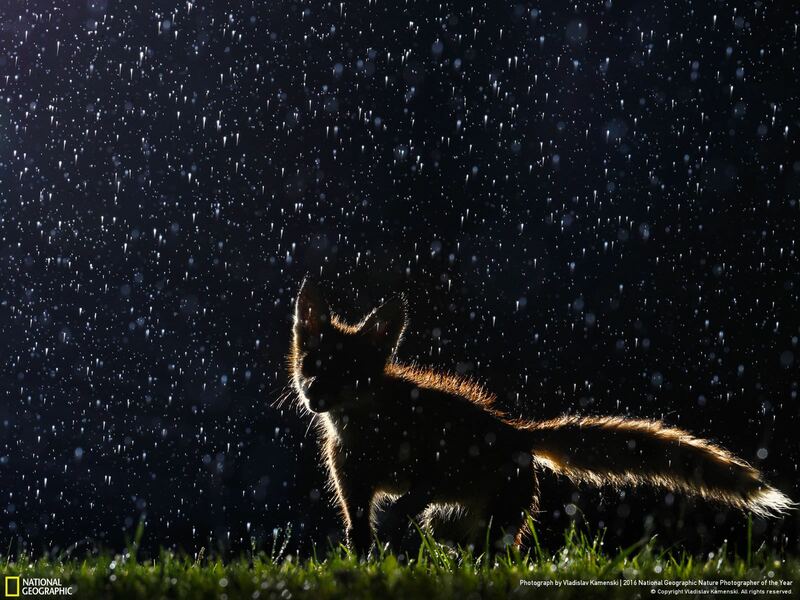 Fox caught in action under the rain. Photo and caption by Giacomo Marchione. 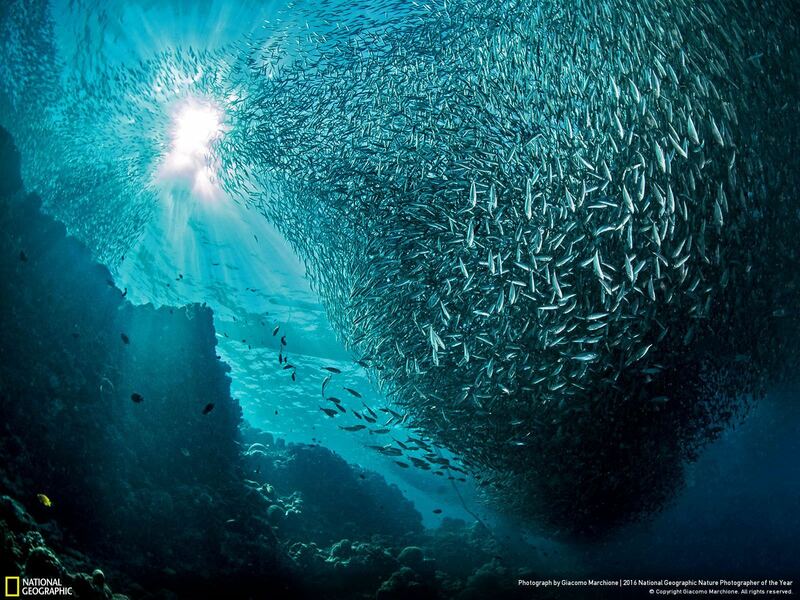 A group of sardines gather like a vortex and seem to touch the sun. Photo and caption by Denis Budkov . 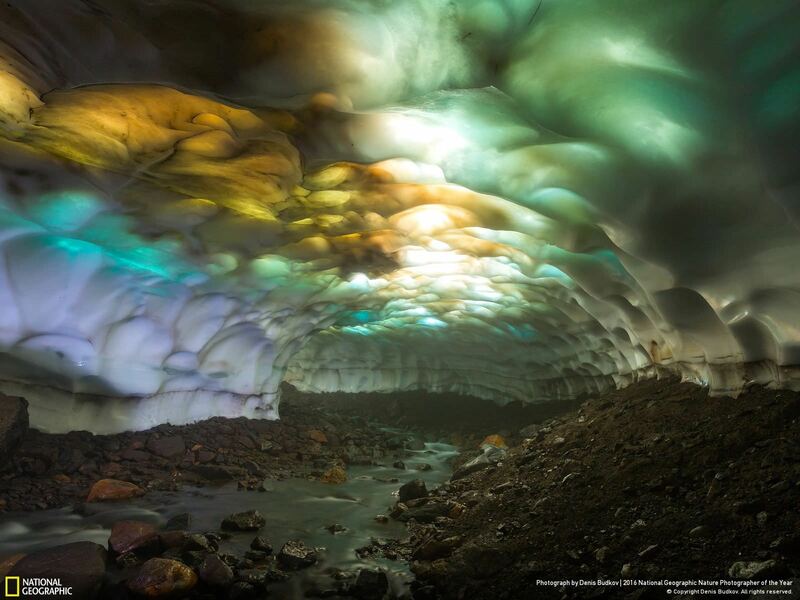 Snow cave on the slopes of the volcano Mutnovsky. Due to of global warming, glaciers have begun to decline. As a result, the ceiling of the cave became thin and the sunlight creates a wonderful picture of the different colours. Photo and caption by Emily Riley. This lil humming bird baby was caught in my home. Here he is recouping from what was a stressful time being stuck. Minutes later her flew away. 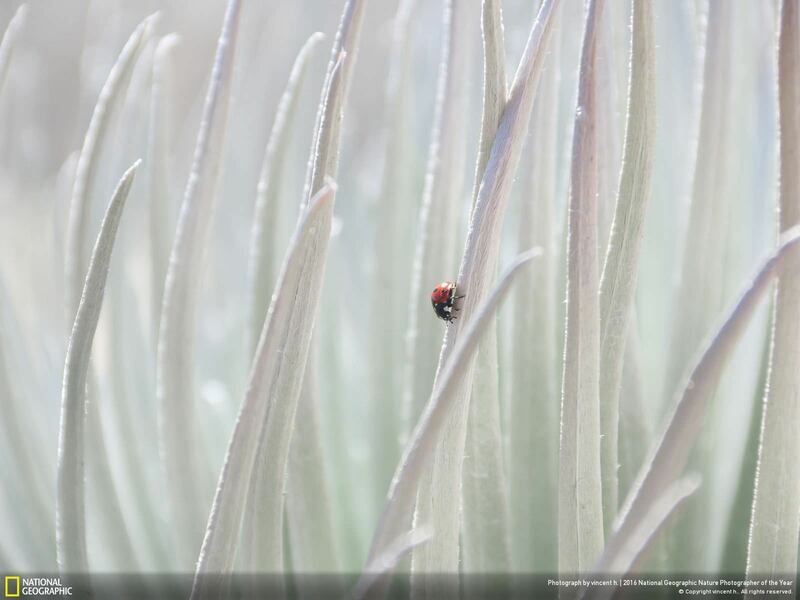 Which 2016 National Geographic Nature Photographer of the Year entry is your favourite?